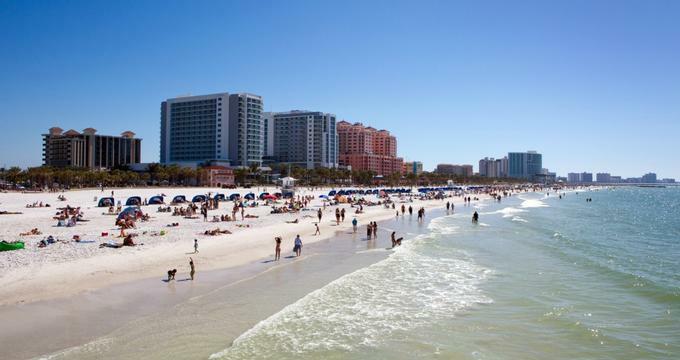 Clearwater is a sunny beach town in Florida's Tampa Bay area with constantly great weather and spectacular sandy beaches. A big part of the city is on a barrier island with the 3-mile-long Clearwater Beach lined with restaurants and hotels. Clearwater is also famous for its marine aquarium, home to Hope and Winter, stars of the Dolphin Tale movie, and for Bright House Field where the Phillies have their spring training games. Surrounded by mangroves filled with wildlife, Clearwater is great for exploring in a kayak or on a paddleboard. 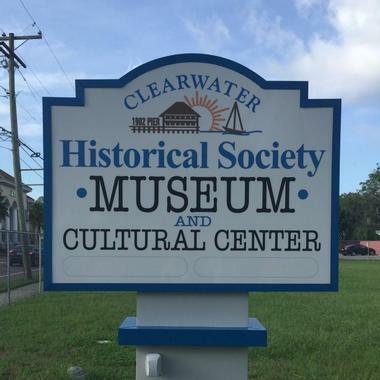 Here are the best things to do in Clearwater, Florida. The Clearwater Marine Aquarium is completely dedicated to the rescue of sick and hurt marine animals. Once they are treated and rehabilitated, the animals such as dolphins, pelicans, and turtles are released into their environment. The aquarium also works on public education, research, and animal-assisted human therapy. Clearwater Marine Aquarium is located in what used to be the water treatment plant in Clearwater. It opened in 1972 and was the site of filming the popular movie Dolphin Tale, in which the two aquarium dolphins Winter and Hope starred, together with several other aquarium residents. Both dolphins are still here and can be visited as they swim in their large pool. Other rescues that live in the aquarium are pelicans, turtles, otters, sharks, sting rays, and many others. Visitors can get quite close to the animals, feed them, and learn about their stories. Only a few hundred yards from the busy US 19 and blacktop filled with strip malls and fast food restaurants is Moccasin Lake Nature Park, a hidden gem in the heart of Clearwater and a wonderful, serene place for families to spend a day in nature. They can stroll along shady, tranquil oak-lined trails, take educational hiking tours, see nature exhibits, or take kids to educational camps. The park stretches over 50 acres of forest full of wildlife such as birds of prey, peacocks, turtles, butterflies, and bald eagles in a special enclosure. There is mile and half of boardwalk-raised trails under the forest canopy, crossing over streams and passing by lush ferns. The Cypress Trail will take you to a bluff that overlooks a large lake. Brigham Dock is an excellent observation point for wading birds. The park’s nature center has a range of activities for the kids to do, such as visit a butterfly garden, check out a water tower with a bunch of solar panels, and an aviary. If you would like to spend some time on the water while in Clearwater and want to explore a bit of the surrounding nature while giving yourself some exercise, let Down South Kite and Paddle’s experienced guides give you the time of your life. You can ride the wind with a kiteboard, a new fast-growing sport that combines sailing, surfing, and wakeboarding. You can try paddleboarding and after a short introductory lesson take a 2-hour tour of magnificent waterways filled with dense mangroves, home to ospreys, pelicans, all sorts of other birds, and so much fish. You can enjoy the same waterways in a small one or two-person kayak, or you can just rent equipment from Down South and do your own adventure. It is difficult to have more fun on the water in Clearwater in less than 4 hours than with Captain Mike Troche. It all starts with a roughly 40-minute ride on the inter-coastal waterway until you reach a remote small island know as Three Rooker Bar. As the boat glides through the calm waters, you will be able to observe sea life in their natural habitat. The Atlantic bottle-nosed dolphins love to come so close to the boat you can almost touch them. Before reaching the island, all passengers who want can go for a tubing ride, pulled by the boat and slow or fast, as they wish. Once on the island, guests can go snorkeling and see spider crabs, minnows, stingrays, and even a manatee if they are lucky. For those who prefer to stay dry, the beaches are full of shells, pieces of broken coral, sand dollars, and sea sponges. The captain will provide soft drinks but the guests should bring their own snacks or alcohol if they wish. Encounter with Dolphins is a narrated, 3.5-hour fun sightseeing tour of Clearwater’s harbor. You will enjoy a smooth ride aboard their 40-foot excursion boat, with awnings for shade and comfortable seats. You will learn about our local wildlife and watch the dolphins in their native environment. The boat will stop for about a half hour at Compass Island, where you can collect shells, enjoy a refreshing swim or snorkel, and the kids can expend some energy hunting for treasure. The dolphins you will meet are bottle-nosed dolphins. Large families normally live in Clearwater harbor all year around. If you are lucky, you will also see manatees and many birds such as herons, ibises, egrets, spoonbills, cormorants, storks, and pelicans. There is a good reason why Little Toot Dolphin Adventures usually see more dolphins than other boats. Little Toot is a tug boat, only 40 feet long and stocky, with a lot of power, so it creates huge wake, which dolphins find irresistible – they love to jump over it and frolic around it. The boat is also fairly low, making it closer to the water, so people can get pretty close to the dolphins. The Little Toot is Coast Guard certified to go up to 3 miles off shore and through the intercostal waterways, finding dolphins in all of their habitats. The Little Toot boat has high fence with safety netting and is perfectly safe for the kids. It has lots of seats, and you can relax under the shade of the canopy or enjoy the bright Florida sun, but wherever you sit, you will have the time of your life. And if by some bad luck you do not see any dolphin, your next trip on Little Toot is free. Philippe Park is the oldest park in Pinellas County, with huge shade trees along the hiking trails, a mile-long path along the shoreline, and fantastic views of Old Tampa Bay. It is great place for picnics, fishing, rock climbing, playing softball and boating. There are two playgrounds for the kids and a boat ramp with access to Tampa Bay. There are eight picnic areas with grills. One of the fascinating historic attractions is Temple Mound from the Native American Tocobaga. It is made of layers of sand and shells and it is believed that there was once a structure on top for religious ceremonies or as a chief’s home. Archeologists think that at some point there was a town plaza at the bottom of the mound and a ramp that led to it. The mound is listed as Historic Landmark. Pier 60 is one of the most popular tourist spots in Tampa Bay. This 1,080-foot-long fishing pier is also a recreational park and has a fully stocked bait house, six covered pavilions, and telescopes. The bait house has not only all sorts of fishing tackle and bait, but also souvenirs, T-shirts, drinks, and snacks. Avid fishermen lining up the pier can catch Spanish mackerel, snook, silver and spotted trout, redfish, sheepshead, tarpon, snappers, jacks, flounders, and many other species. Pier 60 has one of the largest beach playgrounds on the Gulf, keeping the kids well occupied. As the sunset approaches, Pier 60 transforms into a festival with artisans, musicians and street performers, tourists and locals all enjoying the daily spectacle of one of the most magnificent sunsets they have ever seen. The Ream Wilson Clearwater Trail is a multi-use bike and hike trail that links the Pinellas Trail and the planned Florida Progress Trail. Still in development, the trail will provide a pleasant, safe, and educational off-road trail that will connect the Gulf of Mexico and Tampa Bay from Clearwater Beach to Safety Harbor. The trail takes advantage of public property, rights-of-way, and easements to avoid going through private land. After the trail is fully completed, it will connect a number of neighborhoods and more than 20 parks, educational, and recreation facilities. The trail will offer opportunities for nature walks, picnicking, photography, fishing, or just pleasant relaxing time. 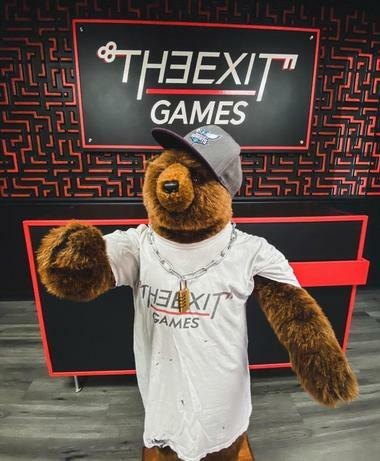 It is already becoming a popular leisure time space as well as an important commuter route for students and workers from the central Clearwater area. Café Ponte is one of Clearwater’s best-kept secrets; an elegant, upscale restaurant with comfortable furniture, white tablecloths, understated décor, and open kitchen, this is where all the action is. Chef Chris Ponte offers New American fare with touches of French, Italian, and Asian influences, creating an interesting and unexpected fusion of flavors and ingredients. Try the soft rib with Moroccan carrot pure, roasted pearl onions, sesame dates, almond oil emulsion, and cilantro; it pretty much illustrates what to expect. For true foodies, the chef offers a la carte and tasting menus. The extensive wine list perfectly complements the menu and the funky zig-zag bar offers interesting cocktails and choice drinks such as aged Grand Marnier. 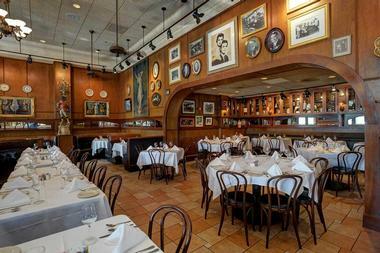 Columbia restaurants have been a popular destination in Florida for Spanish and authentic Cuban fare since 1905, when Cuban immigrant Casimiro Hernandez Sr opened the first one in Tampa's Ybor City. The beautiful, opulent dining room and spacious deck overlooking the gleaming intercostal waterway are the perfect setting for a lunch with friends or a celebratory dinner. All Cuban favorites are on the menu, from fabulous black bean soup to stuffed piquillo peppers and huge selection of tapas. Don’t forget to try authentic Cuban desserts like churros and tres leches. The lovely breezy deck is a perfect place for a cold mojito, some fruity cocktail, or cold cerveza. Safety Harbor is a harbor in the northwestern part of Tampa Bay, almost completely landlocked. The charming small town of Safety Harbor is located on the west shore of Tampa Bay. Part of very old Florida and with tunnels of old oaks dripping moss over brick-paved streets, the town is perfect for leisurely strolling on foot and checking out lovely boutiques, pubs, and restaurants. Philippe Park is perfect for a picnic in the shade of ancient hardwoods. Explore the large, ancient Native American settlement with its big ceremonial mound and pamper yourself at the Old Safety Harbor Resort, where you can swim in the healing waters of a natural mineral spring. 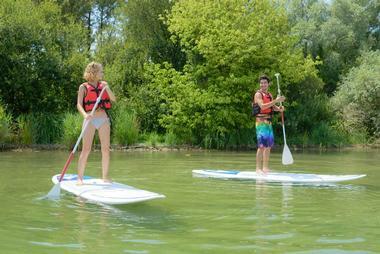 Stroll along the fishing pier and drop a fishing line or take a tour of the mangroves by kayak or paddleboard. 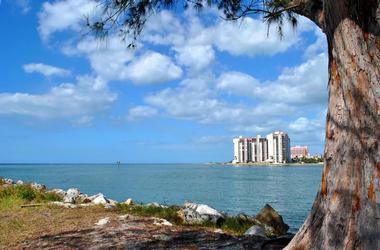 This beautiful Clearwater park has two areas—a wide sandy beach and a park. The park has two picnic areas with shelter for shade, grills, picnic tables, water fountains, a restroom, and a kids’ playground. There is also a designated dog park area. One part of the park is a salt marsh with benches from which people can observe herons, anhingas, roseate spoonbills, great horned owls, and common moorhen as they nest and feed. The beach is also known for sea turtle nests. Clearwater Marine Aquarium keeps an eye on the turtles and records the statistics on the turtles’ visits and the number of eggs, as many marine turtle species are endangered. The park is also the base of a project for building an artificial reef in the Gulf. Sea Dog Brewing Company is a Maine brewer of traditional English-style beers using the highest quality ingredients such as British top-fermenting Ringwood yeast and English two-row malted barley. Their brewery and pub in Clearwater are their first in Florida and they have gained quick popularity. The pub is English-club style comfort with leather couches and TVs on the walls, but the beer is pouring from the shiny taps and the beer fans are flocking in. They also have a spacious outdoor terrace for an evening under the stars. The extensive menu offers classic pub grub with a few extras such as fajitas with everything, giant burgers, and blackened shrimps on skewers. Wildflower Café is charming breakfast and lunch spot hidden under the old oak trees in Clearwater, a popular neighborhood cafe where locals come for a cup of tea or coffee with some of their fabulous pastries in the morning, or for a pot of hot soup with the quiche of the day. Their Sunday brunch is a must. The market portion of the café is filled with delightful take-out foods like salads, sandwiches, quiches, and sweet temptations. 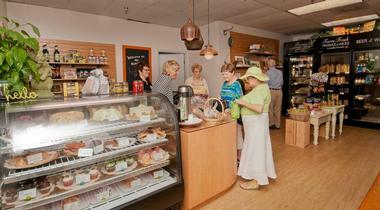 The café is conveniently located right next to the Pinellas Trail, so you can grab a snack before you hit it.